While it has taken longer to complete this then I hoped, it brings me great pleasure to review the Mario Nendoroid from Good Smile Company. This Nendoroid follows up on the Luigi Nendoroid and even comes with a few parts to supplement Luigi. 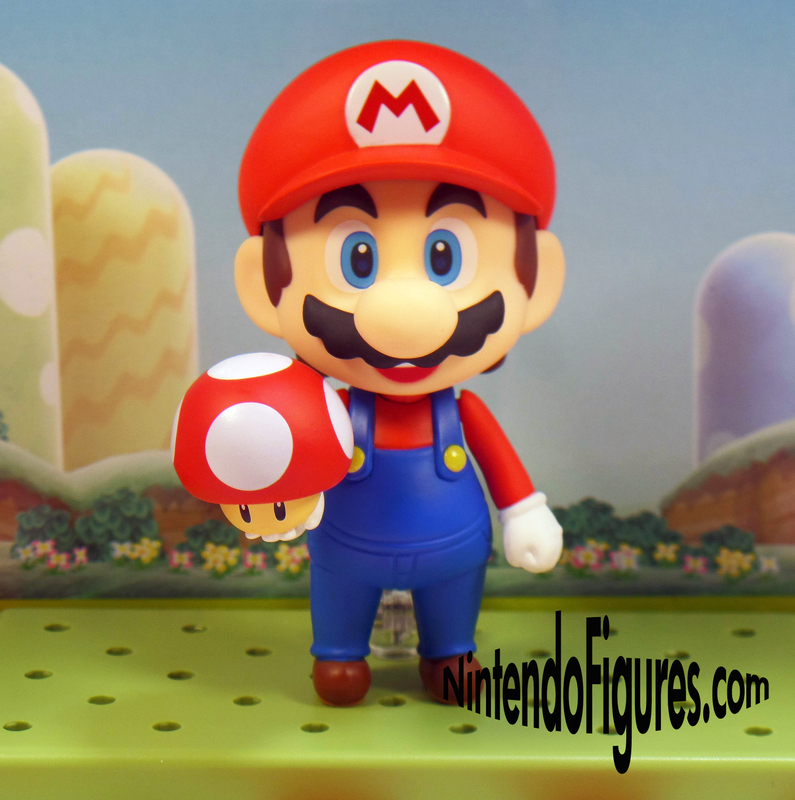 Fear not if you want to just want to get Mario or can’t get Luigi first, the original plumber is a fantastic Nendoroid that is sure to satisfy fans. Packaging – Like I mentioned in the Luigi Nendoroid Review, the boxes for Nendoroids matter to many collectors and Mario has a wider box than Luigi and a slightly deeper one too. This is because Mario comes with more accessories than Luigi and a bigger background. Getting a bigger background is not only great for pictures and displays, but it makes it so you can display Mario and Luigi together. This is a really important addition and something anyone buying the Nendoroids will appreciate. 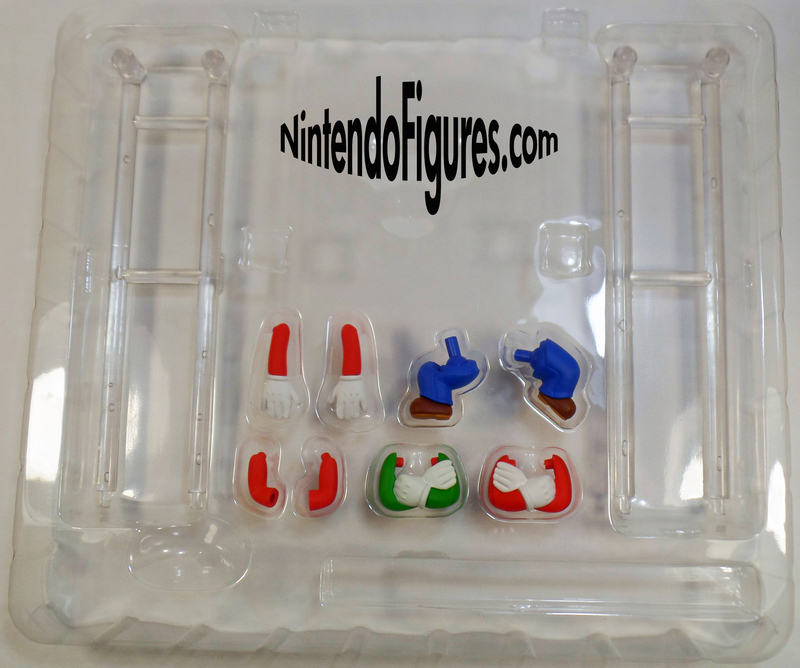 When you open the box, you can see the usual plastic shell which holds Mario and his accessories and underneath that is a second plastic shell with more arms, legs, and a few extra pieces. 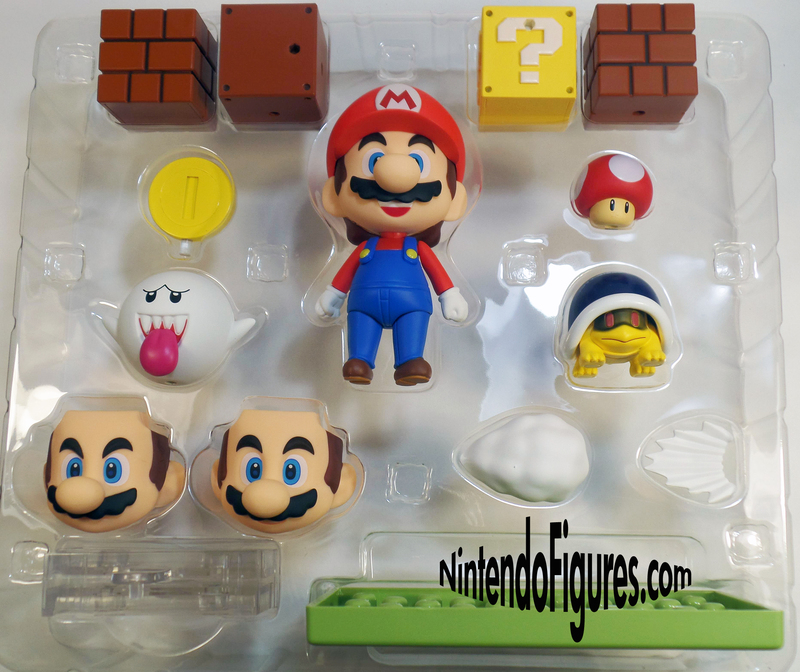 The Mario box has some inspiring examples of what you can do with the figures and the bright red color on the back looks great. 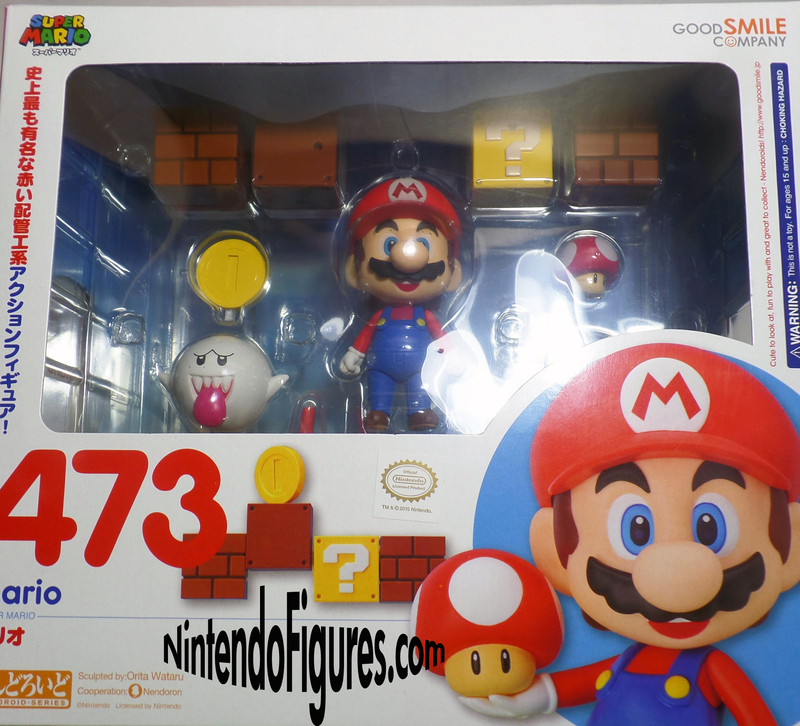 Accessories – Mario comes with a higher than average amount of accessories so we will take a look at the main plastic shell and then the second shell. The first one comes with a mushroom, coin, Boo, Buzzy Beetle, four blocks including one question block, two additional expressions, a puff cloud, an impact piece, and of course, a green base just like Luigi comes with. The blocks are a really nice addition that compliment the Luigi Nendoroid well. 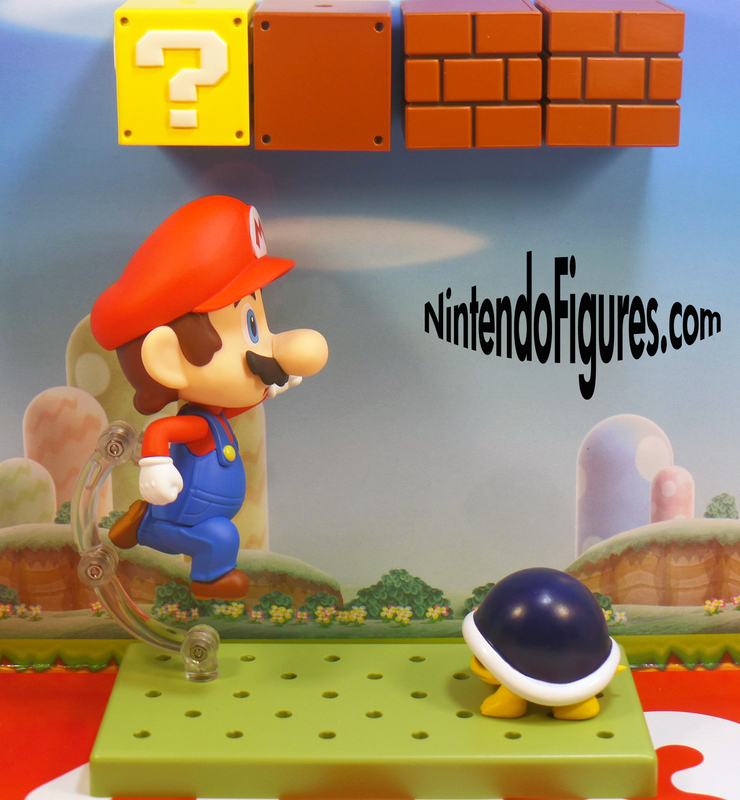 The used block can actually be placed higher than the others so you can attach the coin or the mushroom to make it look like Mario is hitting the block and either one is coming out like in the picture below. I goofed up when taking the picture and you do not need to show the hole in the block like I did in the picture as well. The blocks actually fit onto plastic stands and if you punch the holes out of the background, you can set them up with it to make them look like they’re floating. This looks great and helps Nendoroids stay competitive with the SH Figuarts figures. I will say that the blocks are a bit hard to get exactly straight for when you’re setting up your picture or display, but it is a small price to pay for such great accessories. The major accessories all have nice and clean paint jobs. The coin is a simple flat yellow which perhaps could have been more shiny, but the mushroom has bright colors to help offset this. The Boo has a nice simple white color, with perfect eye decals. Buzzy Beetle also looks great and the glossy color of his shell matches the games very well. My only complaint with these parts is that my Boo is really hard to get on the plastic stand which lets you put it in the air like the Bullet Bill which comes with Luigi. In fact, I tried to get him to go on the stand for a picture and the stand broke in half. This is disappointing and I urge anyone who buys this to be careful with their stand and Boo. Mario has three expressions an open smiling face, a closed mouth smiling face, and a serious, determined expression. These represent Mario’s expressions in the games well and I don’t think there are really any expressions that we could want in addition to these. The puff cloud is very similar to what Luigi has and is a nice touch. You can always borrow a small one from Luigi to add to the running effect too. The impact piece is also great and worked really well in the picture below. 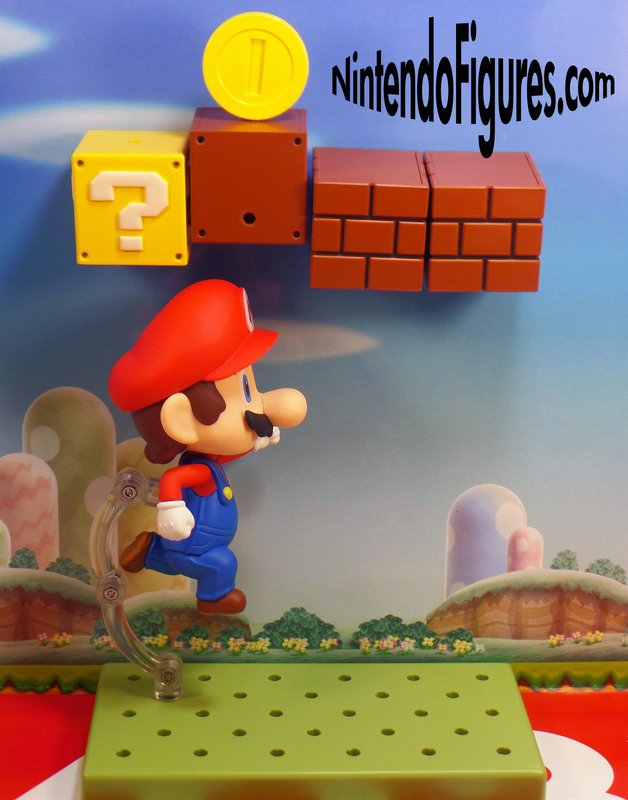 The second accessory plastic shell comes with several sets of arms and legs including running legs, crooked arms for running which I used in the picture above, crossed arms for both Mario and Luigi, and open hands which both have a peg to hold something. The mushroom is currently the only accessory that will work with the pegs, but perhaps we will get more options in the future. There are also two clear plastic stands which go behind/underneath the background both to hold it in place (assuming you actually cut off the red bottom flap of the background which I have not done yet) and to hold the blocks in the sky. One thing that I should note is that Mario’s hands are detachable and can be spun around easily which is nice and gives him a bit more flexibility than Luigi has. 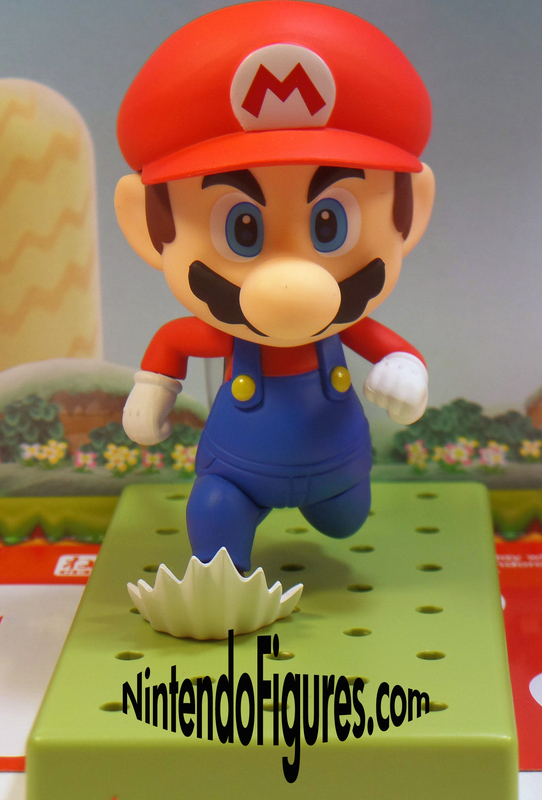 The addition of the crooked arms are really nice and let you pose Mario running much more easily. The crossed arms look really nice, but man, are they a pain and kind of scary to actually put on. I felt like I was going to scratch the paint and ruin something on both Mario and Luigi. The crossed arms fit really tightly and you have to put them on just right to minimize how much you stretch the plastic. In the next section you can see what these look like and as nice as the crossed arms appear, I still am not in a hurry to put Mario or Luigi back into a pose like that. Poses – When I reviewed Luigi, I felt like I showed pretty much all of the most interesting poses he could do out of the box. Mario has more flexibility and I feel like I can only give you a few of the many poses you can try out in this review. From running to jumping either up to the hit blocks or on an enemy, Mario has more action poses than Luigi even just on his own. If you combine with Luigi, the options really start to get out of hand (in a good way of course). I’m not able to use the Boo yet at all and yet I still came up with a number of cool ways to display Mario to show you in this review. My favorite is the bottom picture where Luigi tries imitate his brother to Mario’s annoyance. If you love displaying figures, then you should really consider getting the Mario and Luigi Nendoroid because they will keep you busy for quite some time. 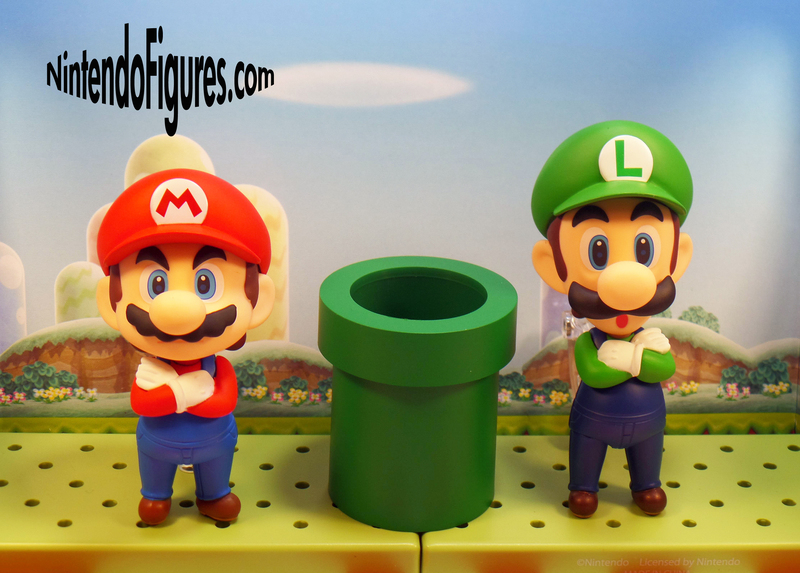 Closing Thoughts – Mario not only builds off of the Luigi Nendoroid extremely well, he is perfectly fine just on his own. Mario expands the options available to Nintendo fans and is worth every dollar. I can’t recommend this Nendoroid highly enough and both he and Luigi are easily my favorite Nintendo figures I own.